Old Bay is undeniably an institution. It's got a handsome, iconic color scheme and a name that sounds like the title of a sea shanty. New Bae, on the other hand, has none of those qualities. It has other ones -- like being hilarious in a way crab seasoning rarely is -- but the venerable seasoning institution is not pleased. 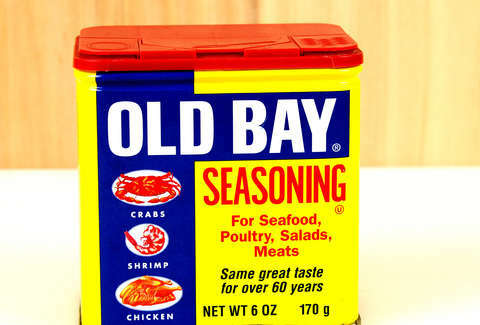 McCormick & Co., the company that owns Old Bay, is suing New Bae. And while that's serious, it's important not to lose sight of how funny this is. The suit is based on the idea that the "New Bae name confuses consumers into thinking the two spices are related, and diminishes the good reputation and value of its Old Bay trademark," reports Bloomberg. Primal Palate LLC acknowledged back in 2017 when the product was announced that New Bae was “a terrible pun,” but we think they're being a little too hard on themselves when it comes to wordplay and maybe not hard enough on themselves when it comes to the intellectual property. New Bae received a cease-and-desist from McCormick back in April. Primal's lawyer then acknowledged that the nod was deliberate and said that Primal “sees McCormick as a foundation of the spice industry" and that in their choice of name "Primal Palate was giving a ‘nod’ to the impact that the Old Bay seasoning has made on the spice market,” according to Bloomberg. Grub Street points out that these products don't resemble each other, at least in packaging. A trademark was going to be issued to Primal Palate, but the lawsuit has put a hold to that until a hearing that's likely to happen next year. McCormick reportedly wants all of New Bae removed from the States, and is also looking for "destruction of all materials bearing the New Bae mark, and cash compensation including Primal’s profits and damages."